My father performed the ceremony. He was ordained through the Universal Life Church so he could officiate at our wedding (although he's since been asked to perform several others). 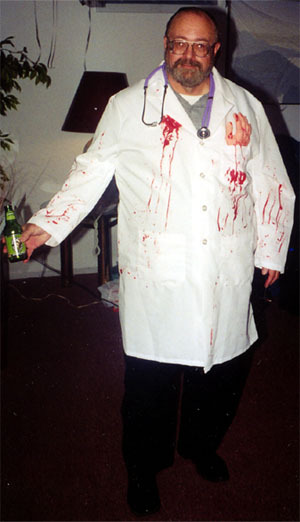 Dad got into the act by dressing as a Mad Scientist, complete with stained lab coat and "severed hand" sticking out of his pocket. After the ceremony, one of my friends suggested that we should have put the rings on the hand's fingers until we needed them in the ceremony. Brilliant idea--wish I'd thought of it. 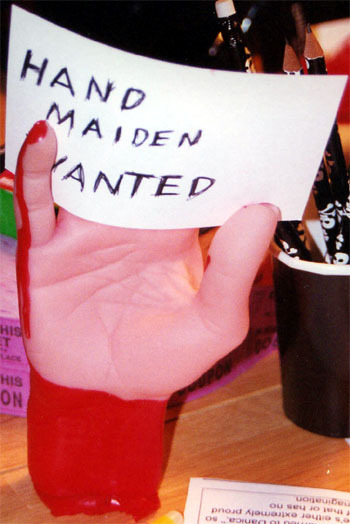 The hand made several appearances around the room during the party. Ths is how I found it when I returned from my hair appointment. Source I gave my dad a small gift (a wristwatch with an old-fashioned hearse on it) as thanks for performing the ceremony. Much depends on who your officiant is. Some clergy will be uncomfortable with any kind of nod to Halloween, and you'll need to respect that. You may be able to convince a reluctant officiant to wear a liturgical stole in autumn colors, or perhaps even one with an applique of harvest motifs (leaves, wheat sheaves, discreet pumpkins). For a Jewish ceremony, consider a festive chuppah in pretty fall colors. You may be able to talk your officiant into wearing a "traditional" version of his or her official uniform. A Medieval-themed ceremony may feature a clergyman dressed as a 13th-century priest. Your officiant may also be willing to wear a costume with religious associations (such as Joan of Arc or Cardinal Richlieu). If your officiant is secular (as mine was), the sky is pretty much the limit. I'd recommend keeping the costume reasonably tasteful, however. Remember that this is, at its heart, a solemn occasion, and your guests may be uncomfortable if you decide to get married by Bozo the Clown or Freddy Krueger.